you to at least take a shower first?" We get it CBS. Pebble Beach is located on the ocean and it is breathtakingly beautiful . . . until you show-us the overhead shot of the 7th green 347 times in four days. For one half hour stretch on Sunday they were literally showing about one golf shot every two minutes between scenic images of the coastline and Jim Nantz shilling for the Monday primetime line-up. 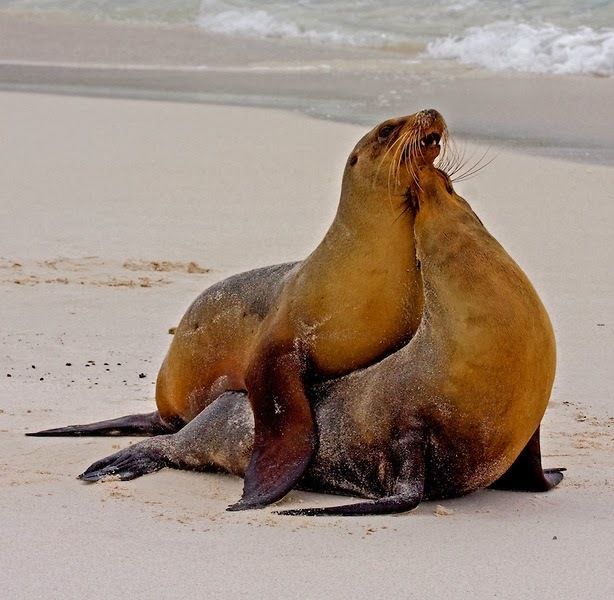 I swear if Phil Mickelson hadn't been in the vicinity of the leaderboard the whole broadcast would have devolved into a documentary on the mating patterns of Sea Lions (holy mackerel odor, pass the AXE body spray). From what I watched on Thursday and Friday, this could go to just about any question asked by the Golf Channel's Matt Gogel who is generally a solid on course commentator just about every other week. However, I don't think a network has handed a microphone to someone less qualified to interview celebrities since a soon to be fired television executive uttered the words, "hey, you know who would make a great talk show host . . . Magic Johnson!" 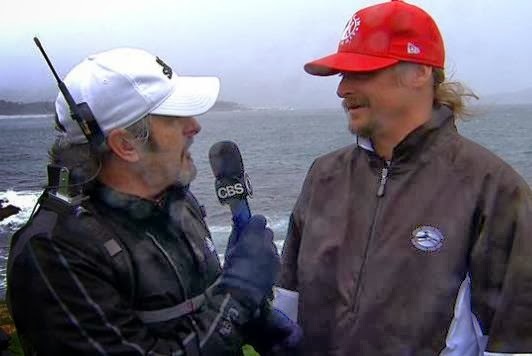 This video of David Feherty interviewing Kid Rock (who just "found the bar") coming out of a rain delay kind of speaks for itself but if you don't feel like watching it, I can summarize it for you by saying that at about the 35 second mark, Rock pushes the microphone away from under his nose and says, "easy Larry King." Apparently he didn't get the memo that everyone is supposed to go along with Feherty's schtick. I fast forwarded through most of Clint Eastwood's visits to the booth but the remote must have slipped out of my hand for the part where Jim Nantz asked him to tell the story of how he saved a guy from choking earlier in the week. Eastwood said that he initially thought the person was joking but then he detected "that look of panic in his eyes." At that point, the Earl of Overstatement, Sir Nick Faldo, jumped in and said, "I bet you know that look of panic from all those times you pointed a .44 Magnum at someone." The ensuing look in Eastwood's eyes said "don't ever interrupt me again Queen Elizabeth." This one is almost impossible to judge because with all of the corporate royalty playing in the tournament, it was like a four day version of Danny Noonan trying to land the caddie scholarship from Judge Smails. (And when did we start getting more CEO's on TV for this thing than actors and country singers?) This award could just go to Ian Baker-Finch's tournament long love affair with the entire field of amateurs and his endless recitations of all the country clubs to which they belong (stay classy CBS). But for this one I have to go back to Feherty who commented how impressed Dustin Johnson and Wayne Gretzky were with Kid Rock's golf game. This came 30 seconds after Rock topped a fairway wood and, oh by the way, Rock and his partner John Daly finished second to last with a score of +8 which means they were 34 shots behind the leaders after the third round cut. You don't have to keep trying so hard David. It's not that Kid Rock doesn't like you. It's just that he doesn't know who you are. I could go on but I shouldn't complain because at least we got to see a tournament played on one of the greatest courses in the world come down to the 72nd hole . . . oh wait, no we didn't because somehow CBS misjudged the finish line by about 90 minutes and switched coverage to the Golf Channel so anyone who DVR'd it saw 60 Minutes instead. Well at least they got to watch some quality interviews. 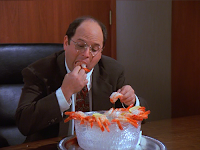 I hear they had Wolfgang Puck on and Steve Kroft opened the interview with, "so Wolfgang, what's going on with food?" Anyway, on to the Northern Trust Open. After last week's debacle, I'm bringing-out the big guns at Riviera CC to get this thing back on track. The field is loaded and I'd feel good about taking any of the favorites listed below but over the last three years, Bill Haas has finished 1st, 3rd and 12th and every year I regret not picking him. On the other hand, Dustin Johnson is playing well and finished 4th in this event in 2012 and 3rd in 2010. Then you have Jimmy Walker, Jordan Spieth, Hunter Mahan and Graham DeLaet who are all ripping-off high finishes every week. Screw-it. I'm going with DJ coming-off his 66 at Pebble on Sunday (because I already used Haas at the Farmers). up for Pebble and I forgot to use them so here you go. Well I was loud wrong last week when I said that we'd see a surprise winner and, in the words of the late great, Dr. Jake Houseman, "when I'm wrong, I say I'm wrong. "**** Red hot Jimmy Walker held on for first with guys like Dustin Johnson, Jordan Spieth, Hunter Mahan and Graeme McDowell also finishing in the top ten. I think the lesson we learned is that, when you can almost smell the bourbon on the logic I use to back-up my picks, you may want to take a look at the choices I make for the PGA Tour and Golf Channel games because those are generally processed Monday morning before the clarity begins to wane.
. . . and because it's "two for Tuesday." * Unintentional comedy occurs when comedy arises from a situation that was not intended by the participants to be comical. This would include every attempted high five between a golfer and his caddie, every sideline shot of Jim Harbaugh and every Keanu Reeves performance since The Matrix (and many before that). For more on unintentional comedy, check-out this somewhat dated Bill Simmons piece. Intentional unintentional comedy occurs when comedy arises from a situation that was intended to be comical and succeeds but for reasons having more to do with unintentional comedy than the comedy that was actually intended. This would include every interview at the AT&T Pebble Beach Pro Am, Rick Reilly's British Open reports and the Situation at the Donald Trump Roast. ** I admit that I was doing a lot of dozing while watching so it may not have been Gogel who did those interviews and if that's the case, I apologize. I am, however, correct about Gogel's awkward interviewing style which made the Chris Farley Show look like Frost/Nixon. surfing scenes in G.I. Jane. *** It should be noted that I love watching the AT&T Pebble Beach Pro Am and I recognize that the former pros carrying the microphones are probably under strict orders to fawn all over the bigwigs even when they want to shred their golf games and call some of them D-Bags. It's just that I am under strict orders to make fun of the way they do it. Everyone has a job to do. It's just business. **** One day I will get around to compiling the full list of movies that are prerequisite viewing to fully appreciate the Fantasy Golf Report but it goes without saying that Dirty Dancing will be in the top 20 along with Wall Street, Good Will Hunting, Top Gun, The Godfather and G.I. Jane.